The nig ht Max wore his wolf suit and made mischief of one kind…. I cannot tell you how many times I have read this book, from my preschool teaching days to my own son, who is now 19. Eventually, I knew the words by heart and only turned the pages for the sake of pictures. 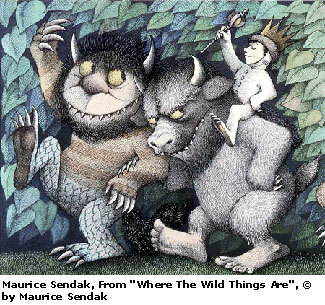 So many children, mine included, became lovers of reading because of Maurice Sendak’s, Where the Wild Things Are. Believe it or not, Mr. Sendak’s book, In the Night Kitchen, is among the 100 most frequently banned books because the main character, a little boy of about 3 years, is (at times) naked in his dream where he floats to the Night Kitchen and becomes part of the batter for Morning Cake. This makes perfect sense, for all mothers know…3 year-old children NEVER take off all their clothes!! Seriously, In the Night Kitchen is a wonderful read! I have read it to my preschool classrooms and to my own children – kids love the book, and they are the world’s toughest critics!! 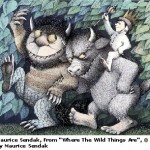 I was saddened to hear Maurice Sendak had passed from this life, but his work will live on forever! Thank you Maurice for Where the Wild Things Are – it will Roar it’s terrible Roar forever, and children will continue to love books and reading because of you! !